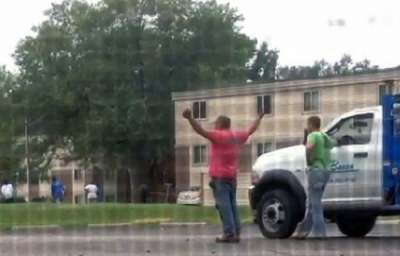 An organized group of anti-racist and Michael Brown protesters staged a singing protest to raise awareness about the injustices in the case of the unarmed teen who was killed in the middle of a Ferguson street by Ferguson police officer Darren Wilson in August of this year. “Which Side Are You On?” was written in 1931 by Florence Reece, the wife of Kentucky mineworker and union organizer Sam Reece. During that year, mineworkers engaged in a violent struggle against greedy mine owners in what would come to be called the Harlan County War. Florence Reece wrote the song “Which Side Are You On?” after law enforcement officers committed acts of violence against her and the children she shared with husband Sam Reece. Sheriff J. H. Blair and his men under the cover of their badges were nothing but paid mercenaries of the mining corporations. Mrs. Reece would later record the song, which has been covered by many different music artists over the years including a remixed rap version by the social/political hip-hop group Rebel Diaz. White men react to witnessing Police Officer Darren Wilson gun down unarmed teen in Ferguson, MO. Ferguson Police officer Darren Wilson despite eyewitness accounts that he executed Michael Brown as the teen attempted to give himself up to the officer, Wilson has yet to be charged. The St. Louis country prosecutor resisting calls to step aside, could have filed charges against Wilson directly but instead chose to ask for an indictment from a secret grand jury that now finds itself under investigation. 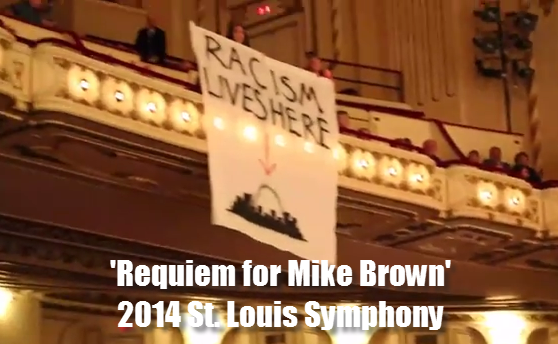 Anti-Racist protesters unfurl -anti-racism” banner from balcony of St. Louis Symphony. St. Louis Symphony protesters were said to be “a mix of African Americans, Latino and white residents – from college kids to college professors” from different communities in the St. Louis area. One of the signs unfurled from the balcony featured a hand drawn logo of the city of St. Louis with the words above it reading “Racism Lives Here“. Support New Black Media for the New Millennium, make a donation to the Black Talk Media Project.